Robert Hughes in The Guardian Review writes a very interesting history of the development of the Catalan national myth through art and architecture. 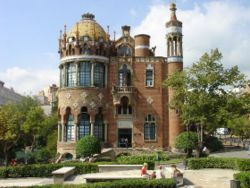 He writes a great deal about Antoni GaudÃ­ but also manages to mention Ildefons CerdÃ (creator of the Eixample) and Lluis DomÃ¨nech i Montaner who designed the Hospital de Sant Pau and the Palau de la MÃºsica Catalana. He also draws attention to bourgeois Catalans’ apparent love for famed anti-Semite, Richard Wagner. His mythological dialogue of the Bavarian/German nation was apparently very attractive to Catalan nationalists for whom the only way to create the new Catalan nation was to root it in the misty glories of medieval times.